Shennette Garrett-Scott is assistant professor of history and African American studies at the University of Mississippi. "Recovering the important and active role black women have played in the development of modern American capitalism, Shennette Garrett-Scott’s Banking on Freedom is a paradigm-shifting work that stands to make a monumental contribution to the field and is certain to inspire future generations of scholars." 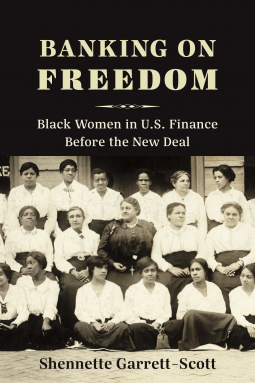 I found myself lost in Banking on Freedom, it is a comprehensive study and documentation of African American women in banking, beginning in the 1800's. This thought provoking read depicts the struggles; how women endured racism and sexism, overcoming barriers and becoming our neighborhoods resources for financial stability. After reading this you are more aware of the role women played in our financial, insurance and borrowing practices. One fact I didn’t know:  the story of the St. Luke Bank in Richmond,Va: the first and only bank run by black women.